Just Vans ( South West ) Ltd established in 2001 and has enjoyed steady growth, year on year. We are now proud to present ourselves as market leaders in the express distribution of palletised goods. As a member of Palletways (UK) the UKs Largest Pallet Network We can offer Cost Effective Next Day Deliveries And Collections throughout the UK. Based in Frome Somerset Our shared-user warehousing services are flexible and can be adapted to your needs. Dedicated Same Day UK delivery / Courier service We operate a same day courier service around the UK. 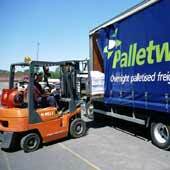 We also offer an Overnight / Next day pallet distribution service from as little as £29.00 per pallet .